EPR oximetry, which enables reliable, accurate, and repeated measurements of the partial pressure of oxygen in tissues, provides a unique opportunity to investigate the role of oxygen in the pathogenesis and treatment of several diseases including cancer, stroke, and heart failure. Building on significant advances in the in vivo application of EPR oximetry for small animal models of disease, we are developing suitable probes and instrumentation required for use in human subjects. Our laboratory has established the feasibility of clinical EPR oximetry in cancer patients using India ink, the only material presently approved for clinical use. We now are developing the next generation of probes, which are both superior in terms of oxygen sensitivity and biocompatibility including an excellent safety profile for use in humans. Further advances include the development of implantable oxygen sensors linked to an external coupling loop for measurements of deep-tissue oxygenations at any depth, overcoming the current limitation of 10 mm. 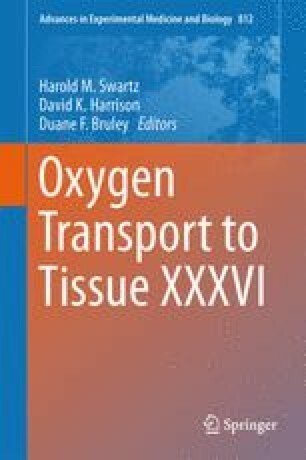 This paper presents an overview of recent developments in our ability to make meaningful measurements of oxygen partial pressures in human subjects under clinical settings. The development and applications of EPR oximetry reported in this manuscript was supported by the following grants from the National Institutes of Health (NIH): P01 EB002180 (HMS), R21 CA121593 (HMS), R21DK072112 (NK), and R01 EB004031 (PK).